We’d love your help. Let us know what’s wrong with this preview of Split Second by Kelli J. Miller. When does the American Dream turn into a trap? What does it mean to succeed? What really gives meaning to our lives? Kelli Miller never had to worry about it--she had it all: a family, a career, a sprawling home, even an executive title. She thought she'd escaped her Midwestern roots and was sailing towards a golden future. Then, in a pivotal moment, confronted with the sh When does the American Dream turn into a trap? What does it mean to succeed? What really gives meaning to our lives? Kelli Miller never had to worry about it--she had it all: a family, a career, a sprawling home, even an executive title. She thought she'd escaped her Midwestern roots and was sailing towards a golden future. Then, in a pivotal moment, confronted with the shadow of death, she found herself suddenly awake to the grim reality: the dream had consumed her life, and left her lost and alone. I've been told never to plan too strictly because life tends to do what it wants. Life can throw you a curveball in the blink of an eye. 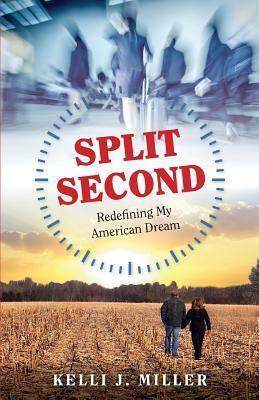 Split Second is a book about how Kelli Miller learned to deal with the curveballs that life threw at her. This was a powerful book that really makes you step back and take a look at your own life. Definitely a good read. *Note: I received a copy of this book in exchange for an honest review. This is a strong novel that really gives you the tools you need to improve your outlook on life and even relationships. I liked the way that this was set up, the writing style was well done and easy to follow. There were many lighthearted and comedic things thrown in that keeps this novel light and spirited. What a powerful novel and powerful voice Kelli Miller has. This was a very real story and it provided plenty of life lessons along the way. This is a heartwrenching story that teaches us that while life throws us major curveballs, we are able to overcome. Empowering and Thought-Provoking and Enlightening all at once. Heartfelt and inspiring book of how your life can change in an instant by things outside your control, but also how you can always improve on your life by taking action. Kelli Miller is a business executive specializing in Information Technology. Her career includes thirty years working for some of the largest, most successful companies in America. Kelli recently returned to her roots, farming her family’s farm with her husband, while continuing her technology career with a local mid-size manufacturing firm. Kelli is the mother of three. She loves to travel, hike Kelli Miller is a business executive specializing in Information Technology. Her career includes thirty years working for some of the largest, most successful companies in America. Kelli recently returned to her roots, farming her family’s farm with her husband, while continuing her technology career with a local mid-size manufacturing firm. Kelli is the mother of three. She loves to travel, hike and spend time in the simplicity and raw beauty of nature.